Businesses and schools across Lafayette will be turning red and white on Oct. 26 and 28 as part of Homecoming festivities at UL Lafayette. The annual business contest pits business against business for best interior and exterior decorations along with skit contest. All participants are encouraged to “paint” their businesses both inside and out with red and white to show their spirit for Louisiana's Ragin' Cajuns. Last year's winners were The Schumacher Group for skit, Lafayette Parish Sheriff's Department for interior and Lowry's Kwik Kopy for exterior. Judging starts at 10 a.m. Local personalities will do the judging an winners will be announced later that day and again during the Homecoming game on Oct. 29 at Cajun Field. Sponsors for this year's event include the Alumni Association, Enterprise Rent-a-car and the Greater Lafayette Chamber of Commerce. On Oct. 28, schools across Lafayette will get a temporary face-lift. Many of the schools will show their Ragin' Cajun pride by turning red and white for the annual Paint the Town Red contest for schools. Schools are encouraged to decorate buildings and campus grounds with the red and white of Louisiana's Ragin' Cajuns. Students and faculty are also encouraged to wear team colors and learn Ragin' Cajun cheers, chants and fight songs for the competition. Preliminary judging will be from 8 a.m. until noon by local personalities. 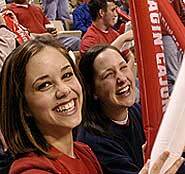 Prizes will be awarded at approximately 1 p.m.
Louisiana's Ragin' Cajuns take on Troy University during Homecoming 2005 on Oct. 29. Kick off is set for 4 p.m. at Cajun Field.